LONDON, 30 June 2017 – NewVoiceMedia, a leading global provider of cloud contact centre and inside sales technology that enables businesses to have more successful conversations, has ranked among the London Stock Exchange Group’s ‘1,000 Companies to Inspire Britain’ for the third consecutive year. The report is an annual celebration of some of the most dynamic and fastest-growing enterprises in the UK. The 1,000 businesses listed have, on average, grown their revenue by 70 percent over the past five years and outperformed their sector peers. NewVoiceMedia now serves more than 650 customers worldwide, including MobileIron, Lumesse, Vax, JustGiving and Canadian Cancer Society. Its multi-tenant intelligent communications platform enables sales and service reps to have more successful conversations with their customers and prospects worldwide. Core contact centre functionality such as omni-channel contact routing, self-service IVR, automated outbound dialling, screen pops and instantaneous CRM updates are provided with proven 99.999% platform availability. “We are honoured to be formally recognised by the London Stock Exchange Group for the third consecutive year as one of Britain’s most inspiring and high-growth businesses”, said Scott Sampson, Chief Revenue Officer of NewVoiceMedia. “We recently celebrated another year of incredible growth and continue to drive innovation that is transforming the way organisations connect with their customers worldwide”. Xavier Rolet, CEO of the London Stock Exchange Group, commented, “Our report highlights the dynamic, entrepreneurial and ambitious businesses across the country that are boosting productivity, driving economic growth and creating employment. The strength and diversity of these companies is readily apparent with a broad mix of regions and sectors represented. These companies are the very heart of the economy: more robust and flexible. We must ensure we continue doing all we can to support high growth businesses like these”. 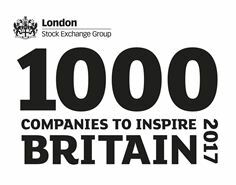 The Rt Hon Greg Clark, Secretary of State for Business, Energy and Industrial Strategy, said, “I want to congratulate the 1,000 companies from across the UK featured in London Stock Exchange Group’s pioneering 1,000 Companies to Inspire Britain report. Championing high growth innovative SMEs is crucial for the continued success of the UK economy and a country that works for everyone. We are committed to ensuring that companies of all sizes can access finance to grow, scale-up and create high quality well-paid jobs across the country”. NewVoiceMedia’s 650+ customers include PhotoBox, MobileIron, Lumesse, Vax, JustGiving and Canadian Cancer Society. For more information, visit www.newvoicemedia.com or follow NewVoiceMedia on Twitter @NewVoiceMedia.